Over the years, the Kuklapolitan Website has received numerous requests for the same information, so here are the answers to those Frequently Asked Questions. If you have more questions or information, please email me. And many thanks to Jim Engel for the above artwork! What was Kukla, Fran and Ollie? 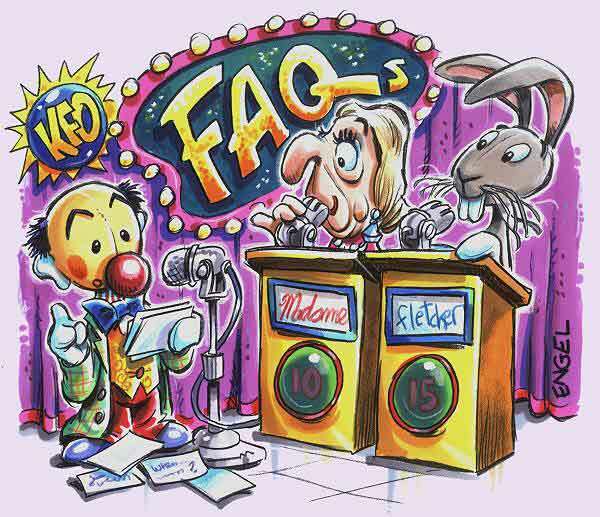 KFO was unique in television history: a live, daily, ad-libbed puppet show that was watched by more adults than children. When did the show premiere? KFO first aired on October 13, 1947 as Junior Jamboree. It changed to Kukla, Fran and Ollie within a few months. When did it go off the air? KFO's first run ended in 1957, but the Kuklapolitans were on the air in one form or another until the mid 1980s. When were Burr Tillstrom and Fran Allison born? Are they still alive? Burr was born on October 13, 1917 and Fran was born on November 20, 1907. Burr died on December 6, 1985 and Fran died on June 13, 1989. No. Fran was married to Archie Levington. Burr never married. Where can I get copies of the show? The earliest episodes of KFO have finally been released on DVD! Where are the Kuklapolitans now? Burr willed all his KFO items to the Chicago History Museum. The Kuklapolitans can be viewed by special appointment in some cases, but it's far easier to see the many papers Burr left to the museum. You must call first. Where can I get more info about the show? Right here! Check The Story of the Kuklapolitans page for many magazine articles about the troupe, or go the the History page for a timeline of significant events. Where can I see a photo of my favorite character? There are many photos of all the Kuklapolitans on the Photos page. Were any of the these characters on the show: Lambchop, Foodini, Pinhead, Lucky Pup, Jolo the Clown, Rootie Kazootie, Beany, Cecil the Seasick Sea Serpent, Farfel, Froggy the Gremlin, Elmer the Elephant, Bertie the Bunyip, etc.? No. Here's a list of all the Kuklapolitans: Kukla, Oliver J. Dragon, Madame Ophelia Ooglepuss, Buelah Witch, Fletcher Rabbit, Colonel Richard Hooper Crackie, Cecil Bill, Mercedes, Doloras Dragon, Werner von Worm, Mrs. Dragon, Mrs. Witch, Miss Coo-Coo, Paul Pookenschlagel, Mrs. Bufforfington, Perry Porpoise, Hubert Skunk, Herbert Hare, Felicia Rabbit, Honey Bird, and of course, Fran! Here are photos of all the Kuklapolitan Players. Burr performed all the characters and was the only puppeteer on the show. Which character said only "tooie tooie" or "tooey tooey"? Cecil Bill, the show's union stagehand. You can hear him sing "Tooie Talk" on the Audio page. What does Kukla's name mean? "Doll" in Russian and Greek. For the full story, read this article from 1952. Where can I get copies of films that were shown on The CBS Children's Film Festival, like Skiny and Fatty, and Three Nuts for Cinderella? Only a few films are available for purchase. Check my CBS page for more info, or leave a note in my CBS Forum to ask about others. Where can I find the Kukla and Ollie puppets I had as a child? Actually, you probably never had one! Burr never allowed any puppets of his characters to be sold, although other toys were sold. There was a counterfeit Ollie sold in the 50s, but no Kukla was ever made. Some puppet-type toys were sold in the 60s. Wasn't there a piece about the Berlin Wall on the show? No, but he did do a series of "hand ballets" on That Was The Week That Was. The most famous was his Berlin Wall ballet. Will the Kuklapolitans ever return to the air, like Kermit the Frog did after Jim Henson's death? No. Burr's Will specifically prohibits anyone from performing the characters.